Aside from a May back injury that sidelined him for a month, Keller had a successful 2017 and reached Double-A in August. He struck out 116 hitters in 116 innings, against just 32 walks, while continuing his career-long avoidance of the home run. He has surrendered just 13 homers in 317 career innings. The foundation of Keller’s profile is grounded in his fastball and fastball command. 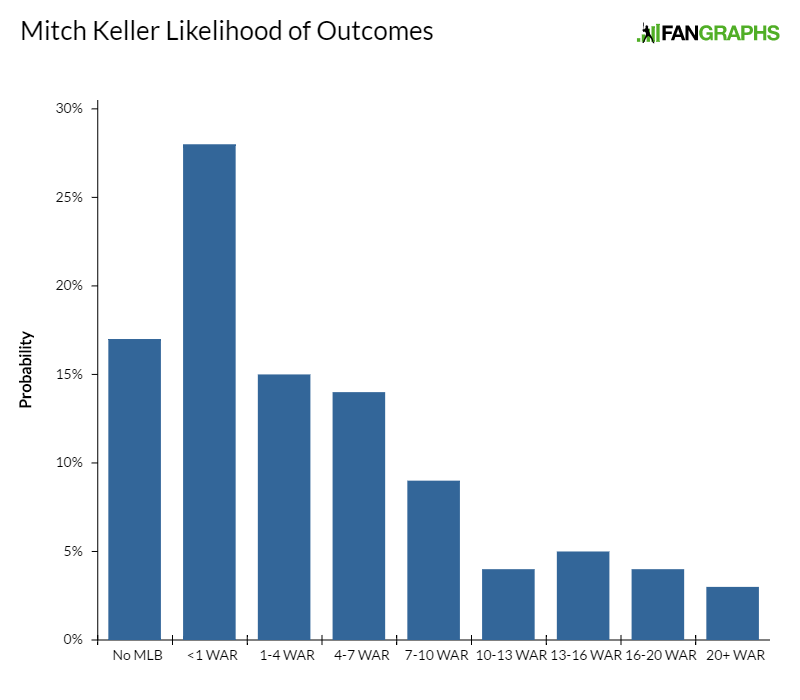 He was throwing only in the upper 80s the fall before his senior year of high school, but Keller’s velocity began to increase as the draft approached, and it has continued to do so. His fastball now sits 93-96 and touches 97. Keller challenges hitters with his fastball in any count and features polished command to both sides of the plate. He projects to have plus-plus command at peak. His curveball has picturesque shape and depth but doesn’t miss as many bats as one might expect, instead operating as another way of generating ground balls. It’s a difficult pitch to square up and also projects to plus. Keller’s below-average changeup is firm and lacks movement. His long, stiff arm swing makes it difficult to project on the changeup, nor are scouts optimistic about it becoming an impact pitch. Some think Keller’s command of his fastball and breaking ball will be enough to mitigate any platoon issues he might otherwise experience without a good change (a la Chris Carpenter), but others think he needs a better third pitch just to navigate a lineup multiple times. I’m bullish on Keller’s future despite his incomplete profile because he does everything else very well. He probably won’t accrue high-end strikeout totals, and instead projects as an efficient, ground-ball-generating No. 3 starter. Another season, another hamstring injury for Meadows. It was his fourth in as many years and cost him the final week of June and all of July. He spent the first half of August rehabbing his way back to Indianapolis. Once there, he played all of seven games before an oblique injury ended his season, Meadows’ second consecutive season-ending oblique strain. In parts of five pro seasons, Meadows has played in excess of 100 games just once, but he had always performed despite inconsistent playing time until his stay at Triple-A in 2017. Meadows is still just 22 and will probably be the youngest player on Indianapolis’s roster again next season, so for now, let’s ignore what he’s done in limited time at Triple-A and give him time to work through his first-ever baseball failures. Part of Meadows’ attempt to deal with a poor first two months was to re-work his swing as he came back from injury. He ditched the stance and stride that made him successful throughout the low minors and opened his stance up, presumably to see the ball better. Now he’s just closing off his front side before contact and getting very little from his lower half. Meadows has long relied on his wrists and hand strength to generate power and has never utilized a big leg kick or any other mechanical means to supplement his power output, but this new approach is excessively limiting. I’d like to see him return to what made him so good for so long and utilize his natural bat speed and hand-eye coordination as a means of spraying hard, doubles contact all over the field while opportunistically turning on balls down and in for the occasional home run. If he can, then he continues to project as a star center fielder — he’s still a plus runner despite the hamstring issues — with a plus hit tool and more power than his raw homer totals suggest. Baz had among the most electric stuff in the 2017 draft. He was up to 98 in the spring, sitting in the mid-90s for most of his starts while also producing the best fastball spin rates in the draft class. Baz can also spin a power breaking ball and throw a nasty cutter. Both project to plus, as does his fastball, though some scouts noted his heater was more hittable than they anticipated given its velocity. Baz is a tightly wound, but athletic, 6-foot-3 with a good build and room for more weight as he ages. His head-whacking delivery toes the line between explosive and erratic, and he sometimes struggles to throw strikes. That will need to improve for Baz to avoid an eventual move to the bullpen. Most scouts believe in the athleticism (Baz also played the infield in high school) enough to project starter’s command but acknowledge that there is relief risk here. 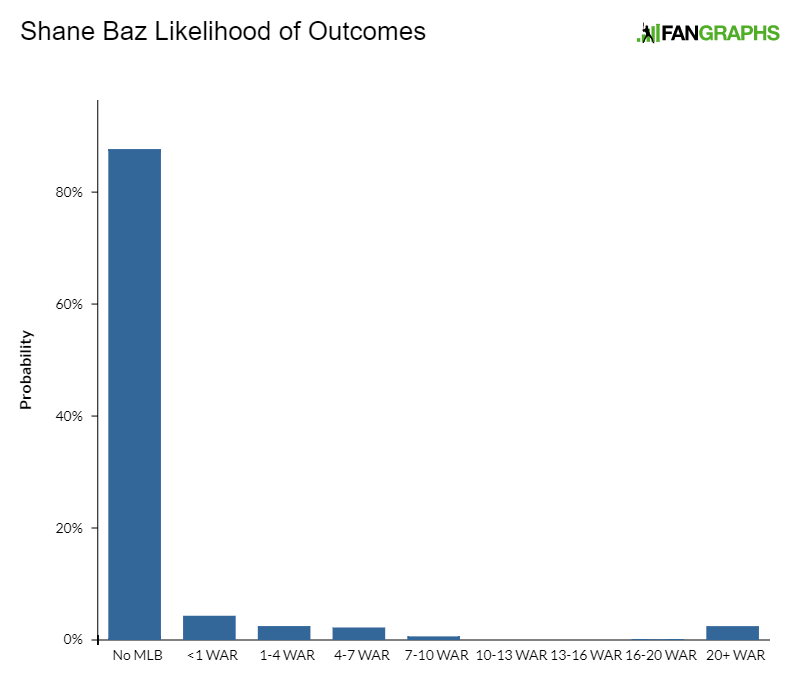 Even if that’s where Baz ends up, his stuff is such that he’s a likely late-inning arm. If he develops average or better command he’s probably an All-Star. As a junior at UNC, Moran was on the short list of candidates considered by Houston for the top pick of the 2013 draft. He ultimately fell to Miami at 6th overall and signed for $3.5 million. He began the 2014 season on the DL due to an MCL sprain and was traded to Houston that summer as part of a package (that also included Jake Marisnick and Francis Martes) for Jarred Cosart. Pro reports on Moran at the time were not glowing. His approach had gone backward and his bat was often late into the zone. Moran’s feel to hit was such that it allowed him to continue making plenty of contact despite his tardiness, but it hurt his power output. Moran wouldn’t slug over .400 for a full season until 2017, when he closed his stance and quieted some pre-swing movement in his hands. The adjustment led to increased power in 2017 that, while his Triple-A stats were likely inflated by the PCL hitting environment, scouts think is legitimate. Moran projects to be an above-average hitter with average game power. At third base, his hands and arm are above-average but his range is below. Moran has dealt with several freak injuries (He’s had two facial injuries caused by baseballs and the aforementioned MCL issue) so perhaps there’s still some development remaining here despite his advanced age. He projects as an average regular who should get lots of playing time in 2018. Tucker is a big-framed 6-foot-3, 185, and is built like Manny Machado was at the same age. Tucker isn’t quite that twitchy, nor as athletic, but he is a plus runner underway and agile for his size, affording him average lateral range at short despite a middling first step. 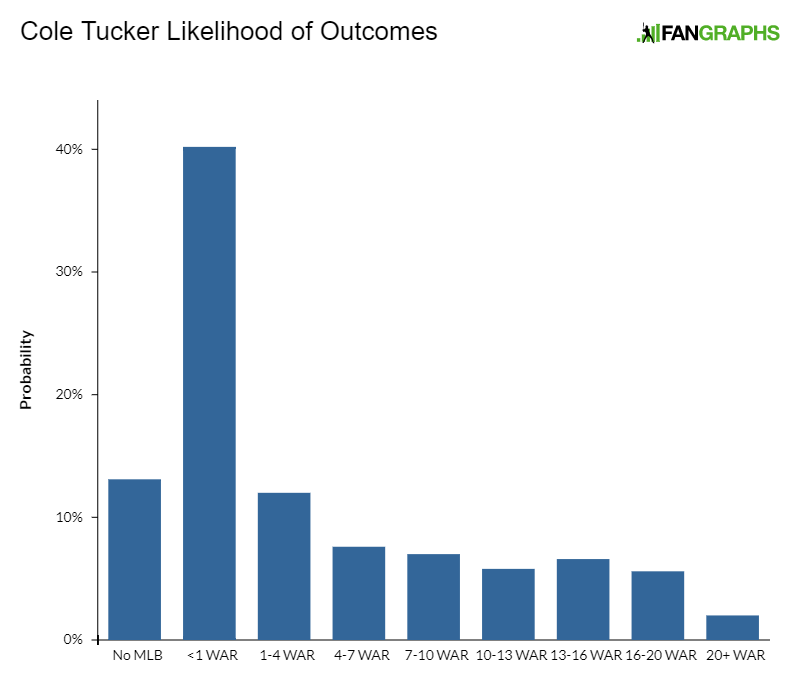 The development of Tucker’s arm strength, which had slowly been improving since 2015 labrum surgery, seems to have plateaued, with scouts grading it as a 50 or 55 on the 20-80 scale. That’s still enough to project him at shortstop, even if he’s just a 45 or 50 glove there at peak. Because arm strength and a good first step are of profound importance at third base, Tucker probably moves to second base in the event that he’s pushed off of short. Tucker has better feel to hit from the left side, where he possesses superior bat control and a more graceful, controlled cut. Most of his in-game power comes from his hands/wrists with little coming from Tucker’s lower half. Combined with a patient, contact-first approach to hitting, that leads to lots of doubles down the line and to the right-center gap. He projects to clear the league-average shortstop hitting line of .260/.315/.407, and he could be an above-average regular if he grows into a bit more power. He was slated to pick up at-bats at the end of the year in the Arizona Fall League, but a broken thumb ended his season. 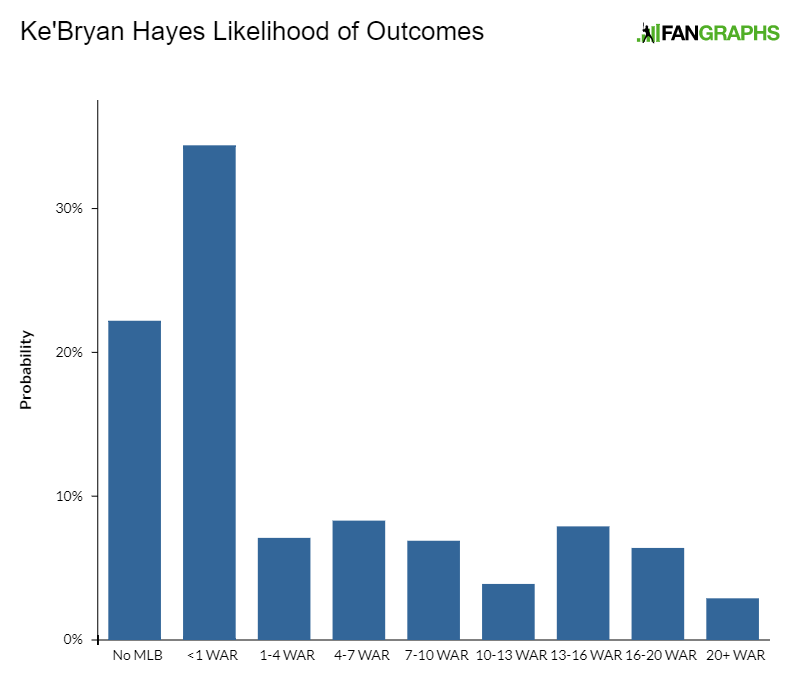 Hayes has one of the more oddly shaped tool profiles among premium corner prospects in the minors. He is a plus runner who stole 27 bases in 32 attempts last year and probably the fastest third-base prospect in baseball. He has great lateral range to his left and right, often making plays deep in foul territory behind the bag and in front of waiting shortstops. His plus arm allows him to hose runners from all kinds of odd platforms. He projects as a plus defender at third, and one source with whom I spoke has a future 70 on his glove. Hayes has an incomplete offensive profile but is a tough out. He tracks pitches well and his sweeping bat path allows him to push the ball to the opposite field when he’s late on velocity, which happens often because Hayes has below-average bat speed. The lack of bat speed leads to a relative lack of power, but Hayes’ ability to make contact and reach base should be sufficient for everyday duty at third. He projects as an average regular but could be a tick better if the glove becomes elite and/or if he adds significant value on the bases. Signed for $450,000 in 2015, Sanchez dominated the GCL in his first pro season in the U.S., slashing .284/.359/.417 with more walks than strikeouts. Sanchez loads his hands low, creating some natural loft in his swing. He’s short to the ball but still generates great extension through contact, a rare combination that signals there’s a chance Sanchez is going to hit for average and hit for power. At just 5-foot-10, his frame doesn’t suggest he’s going to grow into significantly more raw pop, but just on bat speed and an ability to pull the ball in the air reliably, he could hit for 40 or 45 game power. 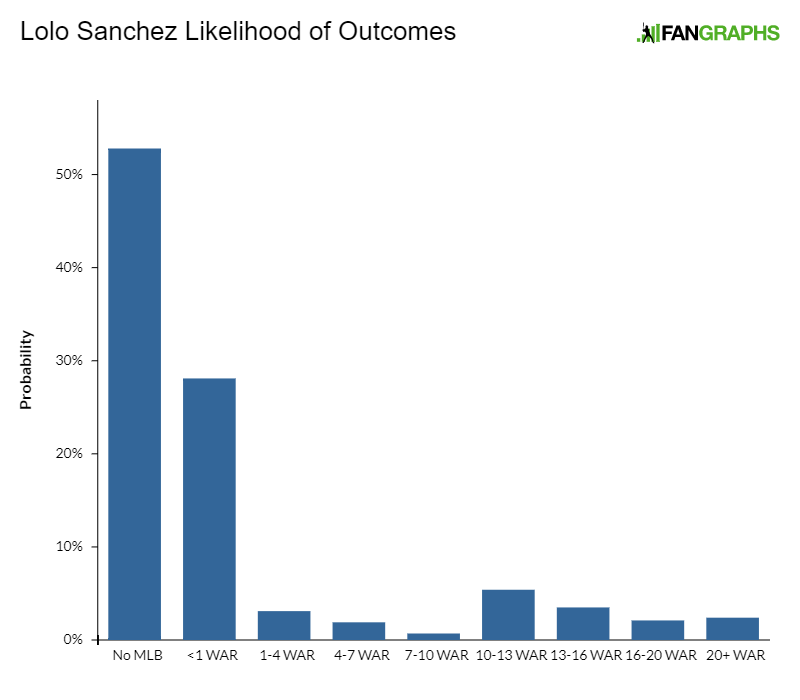 That could be enough to make him an All-Star in center field, as Sanchez is a plus runner and advanced defender. He could have a plus glove at peak. Look for Sanchez to receive an aggressive assignment next year and move quickly as a polished, four-tool, table-setter. Hearn’s regular season ended with an oblique injury in July, and did so just as it looked like he was starting to take off. Hearn struck out 26 hitters in his final 15.2 innings at Bradenton just before the injury and didn’t pitch again until a September tune-up in the GCL while prepping for Fall League. In Arizona, Hearn’s fastball was 90-94, down from the 94-98 mph gas he was pumping earlier in the year. It has good angle and plays up a bit due to extension. Despite his delivery’s ease, he struggled to throw strikes in the Fall League and has struggled throughout his career, as well. 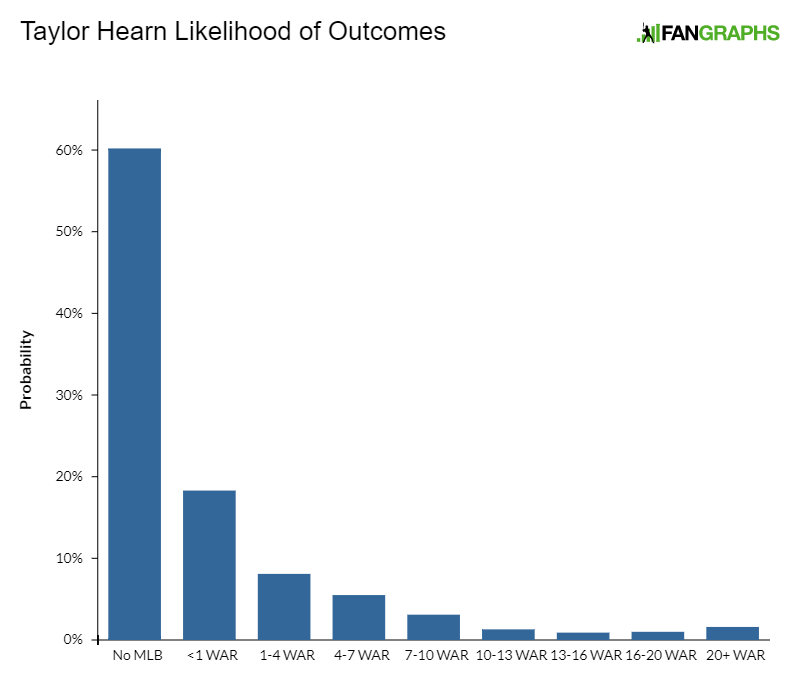 Hearn’s lack of command and long history of injury point to the bullpen. He had a strained UCL in high school and had a screw put in his elbow as a college freshman after suffering two humeral fractures. He had a foot injury in 2016 and then the oblique issue this year. Hearn’s lack of reps due to injury (and because he was working out of the bullpen as a Washington farmhand before being included in the Mark Melancon deal) are also potentially the cause of his undercooked command and secondary pitches. He’s tinkering with his low-80s slider (which, again, featured less velo in the AFL than what I’d seen during the regular season), which tilts in with enough 2-to-7 movement that it can garner swings and misses when located properly. It’s currently average, flashing above. His changeup lacks fade, but if hitters are geared up for 95 or more, it’ll be fine as a tertiary offering that induces weak contact. That’s predicated on Hearn’s elite starter velocity returning next year. There’s no reason to rush Hearn as a reliever, as the value he’d provide as a fully developed rotation piece greatly outweighs what it would be in the bullpen, especially with several other upper-level, relief-only arms in this system. The Pirates’ patience with Tyler Glasnow is a sign they’re willing to wait. I have Hearn projected as a high-risk mid-rotation starter. Escobar has one of the most explosive deliveries in the minors. He takes a big, aggressive stride off the mound and his arm action is violent but efficient, enabling Escobar to generate as much velocity as his curvacious 6-foot-1 frame will allow. He sits 93-95 and will touch 96 throughout the course of a start. He was up to 98 in his Futures Game appearance. 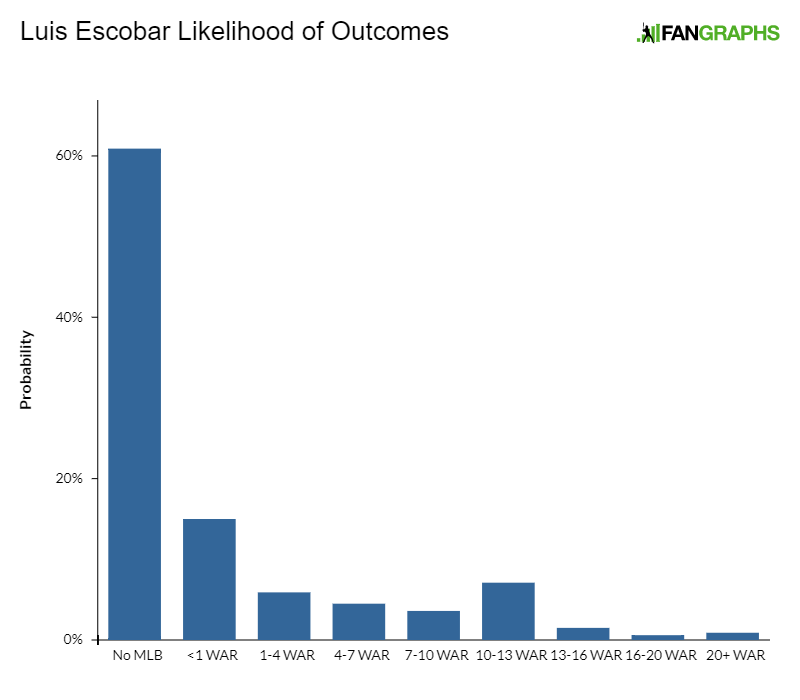 The violent nature of the delivery also leads to enough wildness that many scouts have Escobar projected into the bullpen. He’ll show glimpses of east/west command of the fastball and has potentially dominant secondary stuff in a plus-flashing curveball and changeup. Escobar can throw the power curveball for strikes in the zone or back foot it to left-handed hitters, while his cambio has swing-and-miss fade. If he can refine his control, he’s a mid-rotation piece. If not, he’s a back-end bullpen arm. After a multi-year track record of offensive success at Vanderbilt, Reynolds seemed likely to go somewhere in the 2016 draft’s first round. Some combination of signability and concerns about swing and miss pushed him into round two. He signed for $1.35 million. Reynolds has several average, or slightly above-average, tools. He runs well enough that some scouts like him in center field, he generates above-average power on contact and has some feel for moving the barrel around the hitting zone. He’s also apt to chase breaking balls down and in 2017, his first full pro year, he struggled through April n the Cal League before righting the ship and finishing with a .312/.364/.462 line. Reynolds is now 23, has some swing and miss issues and isn’t a consensus enter fielder. His tools are well-rounded but not exceptional, so his realistic ceiling, especially if he has to move to a corner, is modest. He has a strong shot at being an average regular, or just shy of that. 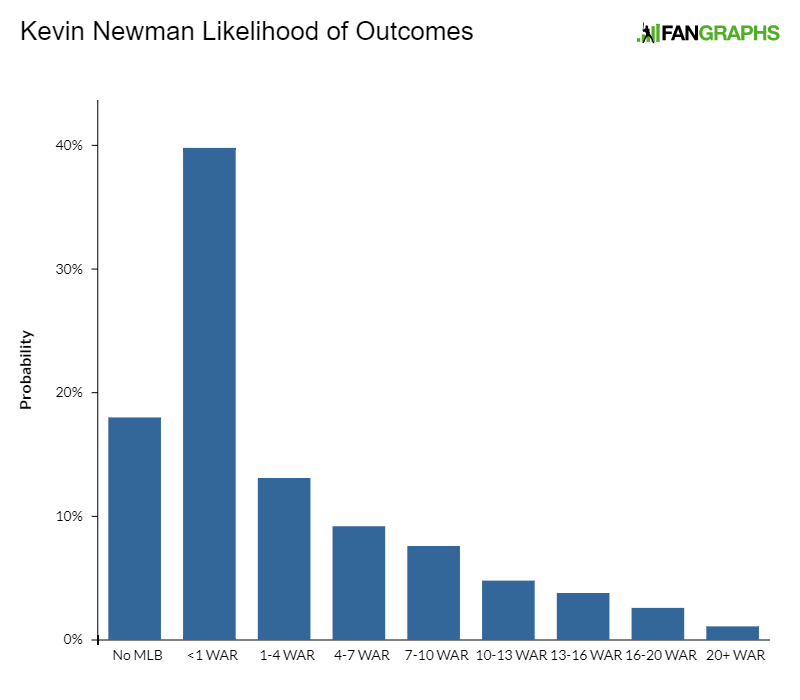 The owner of a measly 10% career strikeout rate, Newman’s carrying tool is his deft bat. It’s quick, and he has exceptional hand-eye coordination that allows him to make contact all over the strike zone — and sometimes outside of it. Newman’s offensive profile has been one-dimensional since his days at Arizona, and he hits for almost no power. Optimists saw his college swing, which operated without aid of his lower half, and thought pro player development could unlock more power. Combined with Newman’s bat-to-ball ability and favorable defensive profile, that could make him a star. While Newman is employing more of a leg kick than he was at U of A, he’s still not hitting for power, and at age 24, it’s looking unlikely that he ever will. At shortstop, Newman is just fine. He has plus straight-line speed but only average lateral quickness and range, and his arm just barely passes on the left side of the infield. If his ability to reach base in the majors is hampered by his lack of power, then Newman projects as more of a fringe regular than an average everyday player. Jennings tore his ACL playing quarterback last fall but was up to 96 during his senior spring while pitching with a knee brace. He’s also shown promising feel for two different breaking balls, and some scouts think he’ll have a plus slider at maturity. He is athletic and more physically projectable than many of the other prep arms from the 2017 draft. 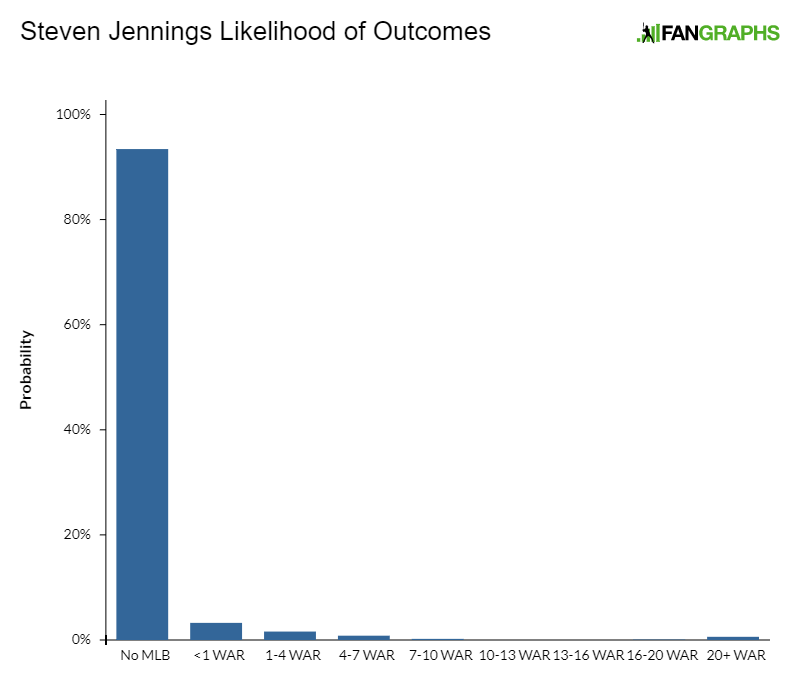 Jennings signed for an overslot $1.9 million as the 42nd overall pick and has mid-rotation potential. Alemais hadn’t been hitting for 30 games at Low-A when he went down for two months with a thumb injury. Despite this, he was sent up to High-A Bradenton when he returned, and he had a strong final month there, slashing .317/.393/.406. 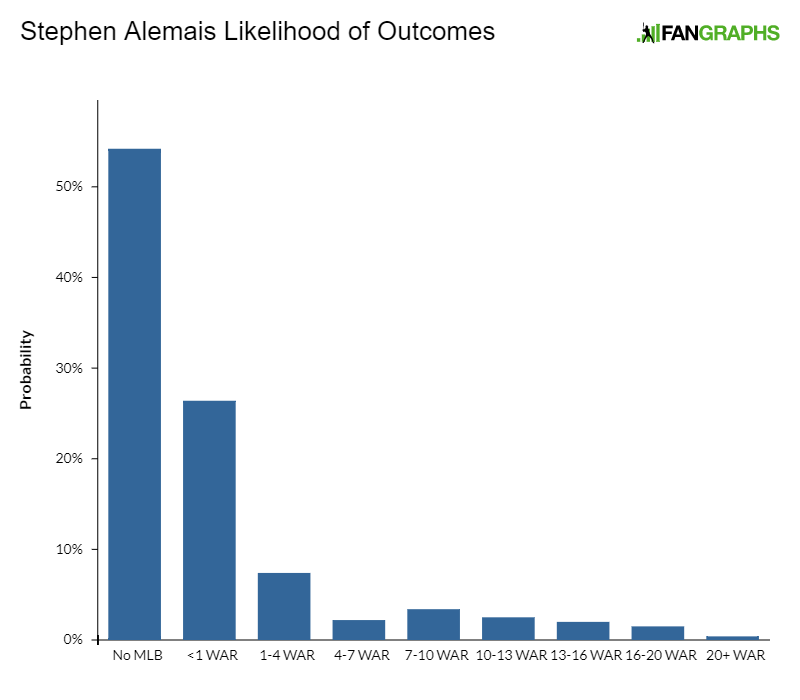 Scouts see this as an aberration and still consider Alemais a glove-only prospect unlikely to hit enough to project as an average everyday player. He has one hell of a glove, though. Alemais is rangy, acrobatic, and has a plus arm. He’s a future plus-plus defender at short whose bat will likely limit him to below-average everyday value or a bench role. Kramer had great natural feel to hit in college, but scouts weren’t optimistic about his ability to play shortstop, nor about his ability to hit for enough power to profile anywhere else. He’s a baseball sponge, incessantly discussing hitting in the dugout and, in pro ball, quickly took to an adjustment that lowered where his hands load. It increased the loft in his swing this year. 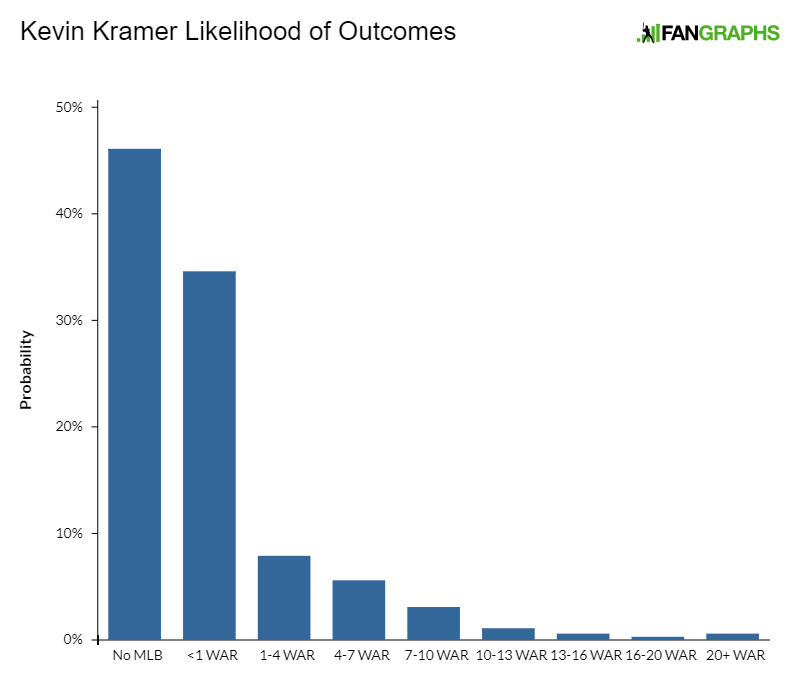 Before he broke his hand in June, which effectively ended his regular season, Kramer had recorded an ISO twice that of his 2016 mark and while also cutting his ground-ball rate from 55% to 37%. He looked predictably rusty in the Arizona Fall League, but it’s clear there’s more in-game power potential here now. The question is, how much? A larger sample of upper-level at-bats in 2018 will be telling, but Newman looks more like a likely big-league contributor now than he did last offseason. Scouts aren’t exactly sure what the hell to make of Cruz because most of them have never seen anything like him. He was 6-foot-3 when he signed but now stands a well-proportioned 6-foot-8 in his spikes. His size creates a number of issues with his swing (he’s often late due to its length) and defensive projection, but he already has impressive raw power that enables him to poke out balls with which he’s barely made contact, and he’s remarkably athletic for his size. Cruz is fairly smooth at third base, but most scouts have him projected to either first base or right field because of his size. He has a plus-plus arm that would be wasted at first, but he’d be an incredible target there and already possesses an infielder’s hands. 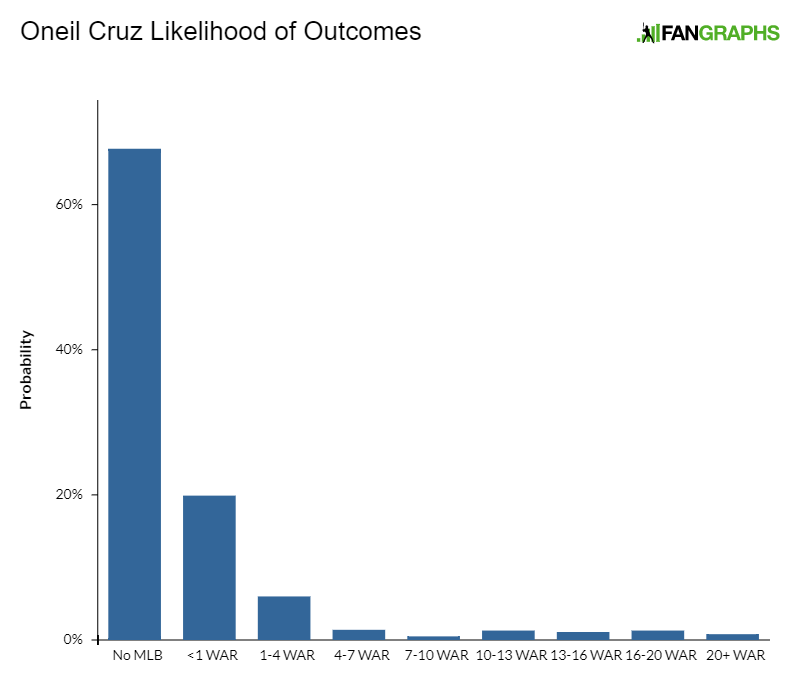 In right field, there would be slightly less pressure on Cruz’s bat. He was so raw in Arizona this spring that scouts were shocked when he was assigned to a full-season affiliate, so his poor statistical performance there is not all that surprising or concerning. Again, nobody is sure what to make of Cruz, but everyone thinks he’s talented enough to be something, probably a power-hitting right fielder. Signed for $200,000, Apostel lit up the DSL in his second year there, slashing .258/.422/.495 with more walks than strikeouts. He has a plus arm and is athletic for his size, giving him some chance to stay at third base even as his massive 6-foot-4 frame fills out. He’ll likely be something close to 240 pounds at maturity, so there’s a chance he may have to move to first base at some point. He has plus raw power projection and, given the room for mass remaining on his frame, you can dream on a bit more than that. Getting to that power in games will require Apostel to exhibit improved control of his extra-long levers. There’s impact power projection here, and if Apostel somehow stays at third base and develops as a hitter as the power comes, he could be a star. If he can’t stay at third and can’t close holes in his swing, he’s a first-base prospect without a complete offensive skillset. This kind of prospect is volatile, but Apostel is one of the more interesting lottery tickets in a system with several of them. Martin made a swing alteration entering 2016 that enabled him to lift the ball more often. He has had two consecutive years of strong offensive output ending with a .273/.320/.483 line and 38 extra-base hits in 79 games at Double-A. He’s a pretty classic tweener outfield prospect capable of playing all three outfield spots but better in a corner and in possession of average power, bat-to-ball skills and plate discipline. Martin struggles against lefties and could occupy the larger half of a platoon in an outfield corner or be a nice bench outfield piece. He’ll be ready for the big leagues soon. Martin went undrafted in the 2017 Rule 5 draft. Already armed with above-average raw power, Uselton’s projectable frame promises more. He struggled against elite prep pitching on the summer showcase circuit and was a bit old for his graduating class, concerning scouts about his ability to hit. If he grows into plus-plus raw power, as is projected, he need only be a 40 hitter to profile in right field. Uselton’s swing has enough natural loft that he should get to most of his power, even if he’s prone to swing and miss. His season ended with a hamstring injury, and pro scouts who saw him in Florida questioned his athleticism. He has a traditional right-field profile with prototypical power, arm strength, and questions about his ability to make contact. Mitchell is a natural low-ball hitter with a beautiful left-handed swing. 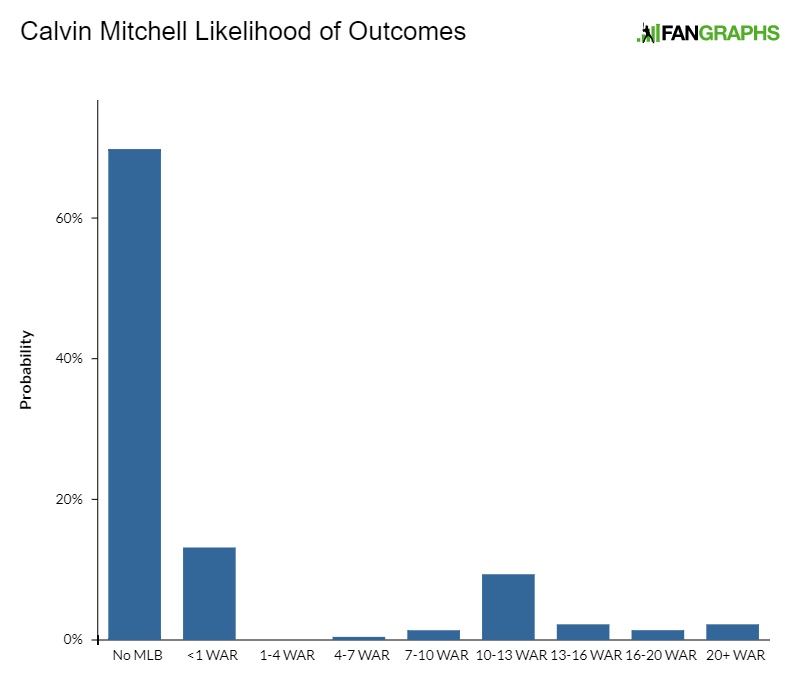 He has some timing issues, and his overall feel for hitting is a bit raw, but Mitchell has natural opposite-field ability and quick, loose wrists that allow him to turn on velocity inside on his hands. Though he’s well built, Mitchell is a fringe athlete and limited defensively to left field. His frame isn’t especially projectable, so much of the power he develops will come from improving the quality of his contact more than it will come from physical growth, making his pop difficult to project. He’s a high-risk potential average regular. Optimists hoped Craig’s plus arm strength — he pitched and played third base at Wake Forest — would help hide his lack of mobility and enable him to be a viable defensive third baseman. But after giving it a try during his post-draft summer in 2016, Craig was moved, full-time, to first base in 2017. 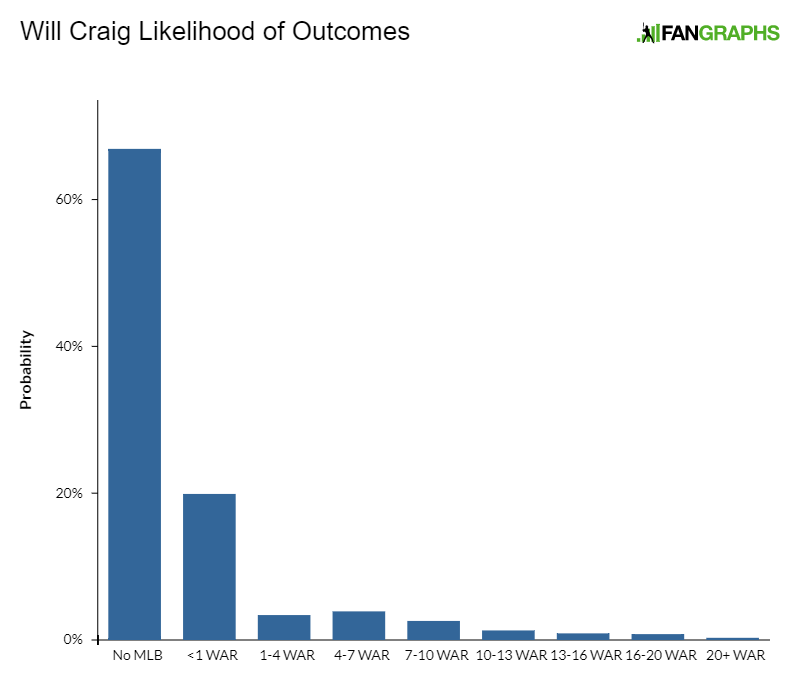 Even in the pitcher-friendly Florida State League, his .371 slugging percentage is a source of concern for a hitter at the bottom of the defensive spectrum, and Craig’s career .091 ISO over 800 plate appearances in Rookie and A-ball is half of what the big-league average at first base was in 2017. Craig is a patient, discerning hitter, and his wrists are quick and strong, but his swing lacks any other explosive elements, limiting his power to the doubles variety. Unless he becomes a plus hitter with elite on-base skills, he probably doesn’t profile at first base. MacGregor’s stuff ticked up just ahead of the 2016 draft, and teams that didn’t see him late considered him a pretty significant reach, even as a minor underslot deal. He’s a malleable athlete with a projectable frame, sound mechanics, and big-league fastball projection. 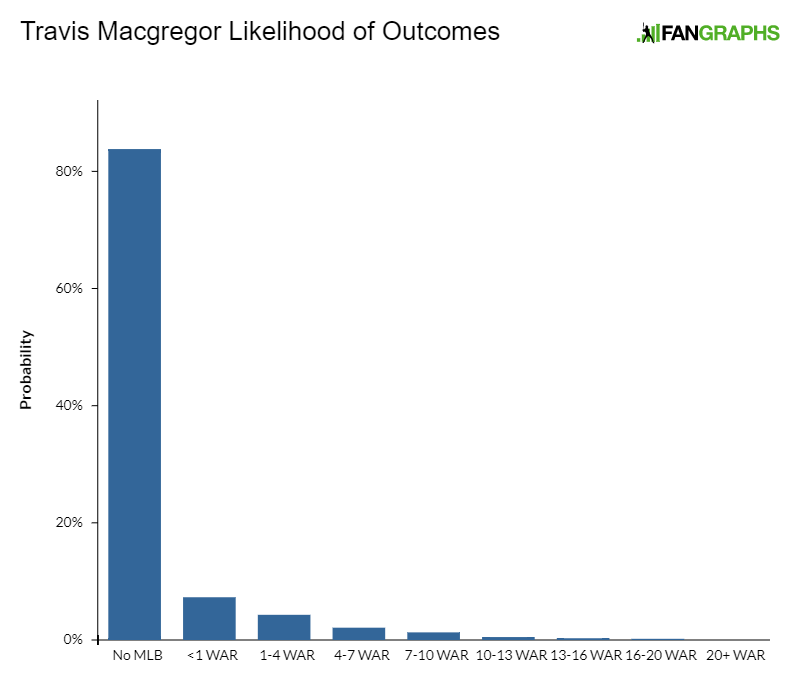 MacGregor’s present secondary stuff wasn’t as enticing as that of most second-round high-school draftees, his fringe changeup a bit ahead of his blunt curveball and its projection more significantly so. There’s no clear, bat-missing secondary offering here, but Pittsburgh has coveted good-framed athletes with workable deliveries in the draft, and MacGregor has all of that. He was seen as a long-term project on draft day, and his 5.11 FIP at Bristol is just confirmation of this, nothing more. Picked in the 2017 Rule 5 draft by Philadelphia and traded to Pittsburgh for a $500,000 international bonus slot, Burdi has closer stuff when healthy, touching 101 and sitting 96-99 with his fastball. He also has a vicious plus-plus slider. He has dealt with ceaseless injuries since turning pro and has thrown just 104 total innings in four pro seasons. He had Tommy John in May (which makes him easier to roster as a Rule 5 pick) and probably won’t be back until mid-2018. He’s an extreme injury risk but has late-inning upside. After spending parts of eight seasons in the minors, Neverauskas made his Pirates debut in April, becoming the first major leaguer born and raised in Lithuania. He shuttled back and forth between Indianapolis and Pittsburgh several times during the summer before a September call-up. In 25 big-league innings, Neverauskas struck out 17, walked 8 and posted a 3.91 ERA. Neverauskas has fringe command of a three-pitch mix led by a fastball that sits 95-98 and will touch 100. He has two breaking balls: a hard slider/cutter at 88-92 and a slurvy, low-80s breaker that, based on its velocity separation from the fastball, is probably a curveball, even it moves like a slider. It’s this breaking ball that has the most promise, as Neverauskas spins it in the 2800-3000 rpm range, but scouts don’t think he gets on top of the ball consistently enough for that spin to be effectual. 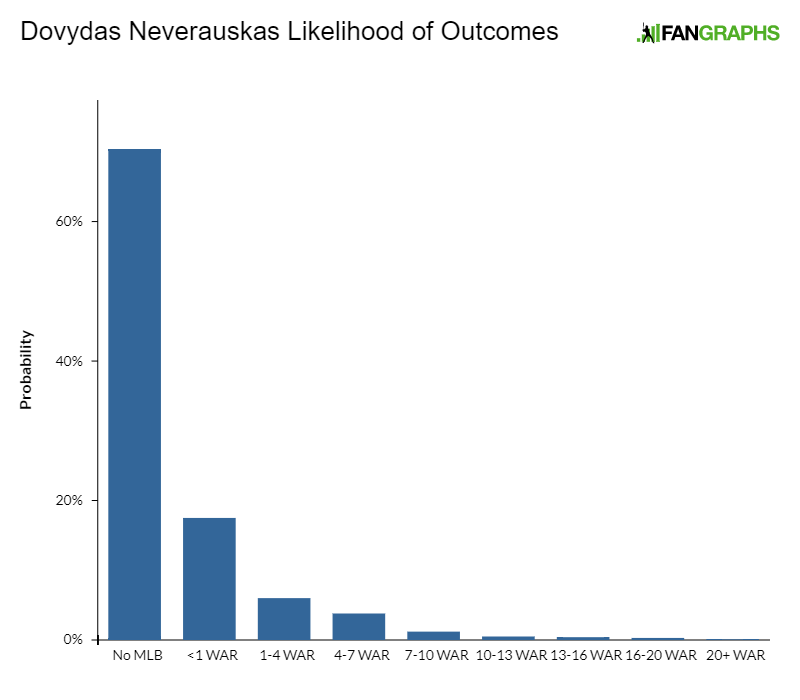 Our data indicates that Neverauskas has a slightly lower release point on the breaking ball than fastball. He profiles as a middle-relief arm, but if the big-league staff can coax more out of that curveball, he could become a high-leverage guy. Either is a great outcome for a $60,000 signee plucked from an obscure baseball locale. All parties involved here — the player, the scouts who thought the 16-year-old Lithuanian kid was interesting, and the player-development staff who groomed him for eight years — have done well. Santana threw 18 big-league innings in 2017. His fastball sits 94-97 with tail, his only secondary pitch an above-average, mid-80s slider. Santana had trouble throwing strikes in a small major-league sample, but he’s never had strike-throwing issues before (despite a long arm swing) and didn’t at Triple-A in 2017. He’s a big-league-ready middle reliever. A hard-throwing fourth-rounder from 2016, Ogle had an unremarkable first full pro campaign at short-season Bristol, posting a 3.14 ERA while struggling with his fastball command and secondary stuff. He has good glove-side command of a fringey curveball, and his changeup feel has improved in the last year, though it remains well below average. Ogle’s delivery is a bit stiff and scouts project on his secondaries pretty conservatively, only maxing them out around average. With plus velocity — Ogles will touch 97 and sit 91-95 — that should be enough to fit in the back of a rotation. 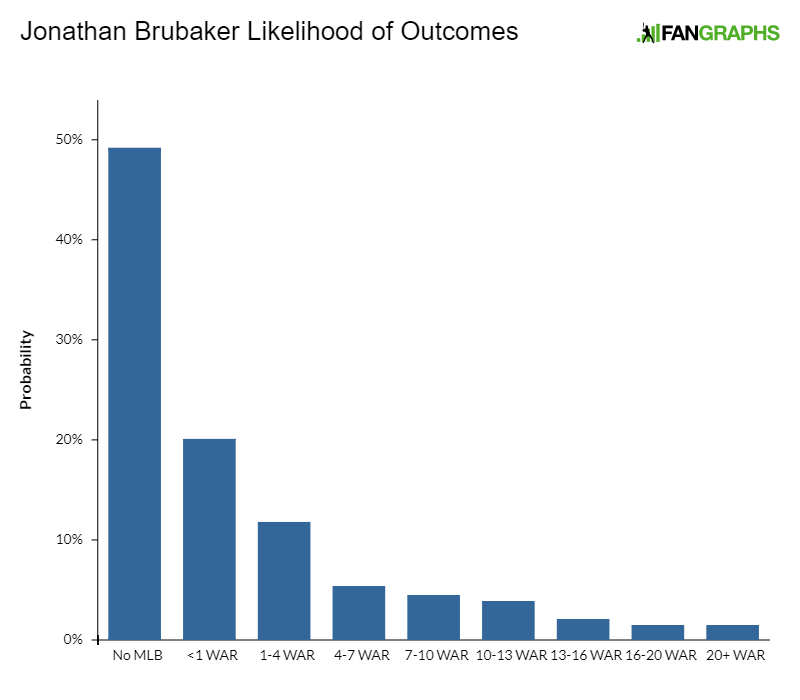 Brubaker’s numbers at Double-A are rather inconspicuous on the surface. He was a 23-year-old who posted a 4.44 ERA over 129.2 innings at Altoona while striking out a modest 19% of hitters. But Brubaker turned some heads in Fall League, where he pitched with a heavy 93-97 mph fastball, and has some late-bloomer traits that indicate he still has room for growth despite his age. He’s a big, well-built, 6-foot-4 righty from a small, Midwestern college program in Akron. Big-bodied pitchers from small and/or cold-weather schools are typically a bit behind their warm-weather peers who get to play more baseball. Neither Brubaker’s slider nor his changeup are especially dynamic, but the former flashes 50 or 55 and should solidify there at peak. Brubaker has a good idea of how to pitch through a lineup multiple times, starting hitters with something offspeed the second or third time he sees them. He’s a competent strike-thrower with a history of durability and some traits that indicate late growth for his secondaries. He projects as a fifth starter or middle reliever. Holmes’ fastball sits in the mid-90s and will touch 99 in short bursts. Scouts anticipate a move to the bullpen due to subpar command and think his fastball might live in that range once a transition is made. There, his fastball will be paired with an average, low-80s breaking ball. 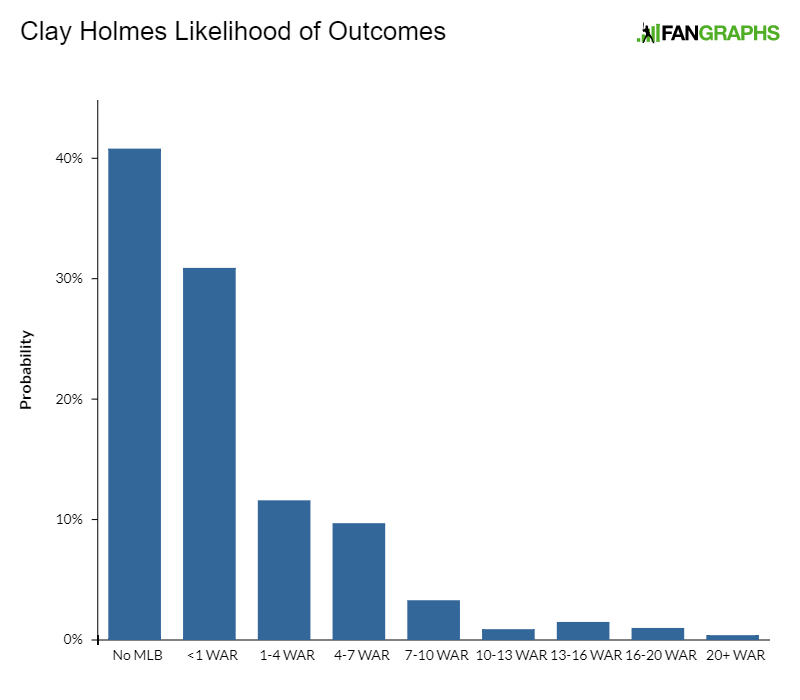 Holmes’ arm strength makes him a likely big-league bullpen contributor, but his secondary stuff will probably limit him to a low-leverage role. Vasquez only signed with Seattle at age 19 but began throwing a high volume of strikes immediately and quickly closed his age/level gap when he shot right from the AZL to Low-A during his first full season. He was acquired from Seattle as a PTBNL in the 2016 Arquimedes Caminero trade. In 2017, he was sent to High-A and continued to attack opposing hitters, walking just 5% of them. 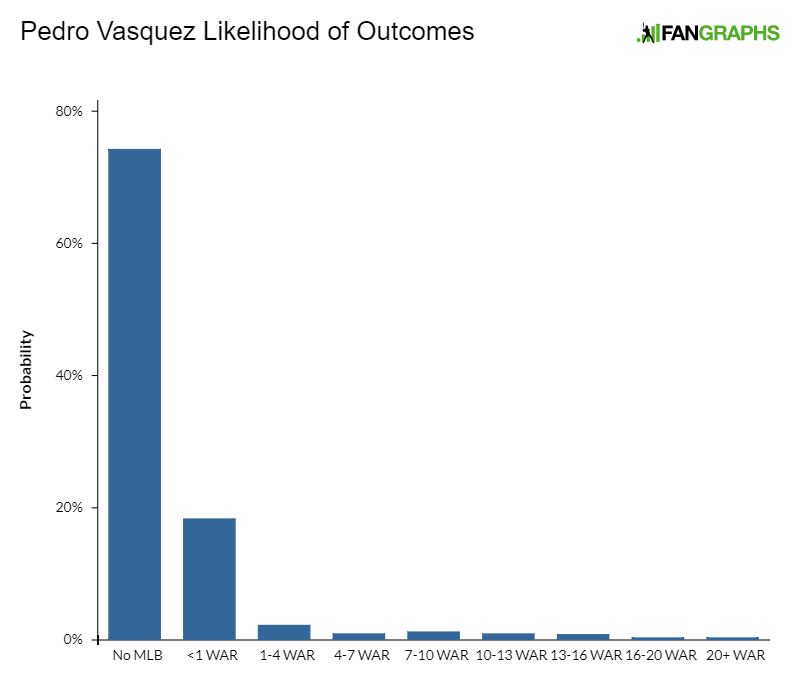 Vasquez’s fastball will touch 95 and sit 90-94 with little visible effort, though he’s a below-average athlete. His low-80s slider is consistently average, and the changeup, also in the low-80s, will flash average and should mature as such. With nothing to miss bats, Vasquez’s ceiling is limited. He projects as an inning-eating back-end starter, if those are still allowed to exist. Jordan Luplow, OF, 3.7 KATOH — Luplow had a monster year at Double and Triple-A, slashing .296/.377/.543 between the two levels before he was called up at the end of July. He features above-average raw power and bat speed, and has been able to tailor his flat-planed swing in such a way that he really began tapping into it last year. Is his minor-league production sustainable? Probably not, as Luplow’s pull-only approach to contact is more likely to be exploited over an extended big-league stay. xStats wasn’t a fan of his batted-ball profile in his short big-league stay, and the variables that inform the expected metrics stabilize fairly quickly. I think Luplow’s power and ability to make adjustments means he has a shot to play some kind of big-league role, either as a poppy bench bat or platoon outfielder, but he’s more likely upper-level 40-man depth. Adrian Valerio, SS, 1.0 KATOH — Valerio had a big year at the plate, slashing .273/.301/.442 with 11 home runs in 80 games, nearly thrice his career total entering the year. The power seems to be a mirage, as Valerio has below-average bat speed and doesn’t get much out of his lower half. He has below-average raw power and an aggressive approach that limits his ability to reach base. But Valerio does have some feel for contact and is a defensive fit at short despite occasionally sluggish footwork. His hands and arm are both plus, his actions are quick, and he should be an average defensive shortstop. That should enable him to profile as a utility man, provided he takes to various other positions in the near future. For now, Valerio has only played short. Eduardo Vera, RHP, 0.2 KATOH – Vera spent three years in the DSL and parts of two more in the GCL before he blew out his elbow. He returned from Tommy John this season and was sent right to the South Atlantic League. He had a wonderful season, walking just 2.6% of hitters over 132 innings. He’s a well-built 6-foot-2, sits in the low-90s with some arm-side movement, and has an above-average changeup. He has a below-average curveball and projects at the back of a rotation right now due to overall middling stuff, but this was a very impressive season coming off of surgery. Domingo Robles, LHP, 1.1 KATOH — Much like Ogle, Robles’ secondaries, especially his changeup, lack great projection, as his arm action is long and stiff. He’ll flash an average curveball — and it should be average at peak — along with his fastball. He’s an advanced strike-thrower for his age, but his body is also mature and it’s unlikely that much more fastball is coming. He projects as a fifth starter. Nik Turley, LHP — A 28-year-old reliever, Turley’s fastball sits 91-95 and he’ll flash a plus curveball, but his command and breaking-ball quality vary enough to render him a fringe reliever rather than a big-league mainstay. Nick Kingham, RHP, 1.5 KATOH — A spring ankle injury delayed the start of Kingham’s season, but he likely wasn’t ticketed for a full-season workload after throwing just 46 innings in 2016 while recovering from Tommy John. Kingham is a strike-throwing, big-bodied righty with above-average arm strength and fringe secondary stuff. His curveball shape is inconsistent but will miss the occasional bat, while his changeup is below average. Kingham is short of regular big-league projection because his secondary stuff is lacking, but assuming good health, he throws enough strikes to slot into a fifth-starter role in the right situation. Tyler Eppler, RHP, 0.6 KATOH — A 6-foot-6, 220-pound righty out of Sam Houston State, Eppler threw 136 innings at Triple-A in 2017 and walked just 5.6% of hitters he faced. He sits 93-95 with a firm but effective mid-80s changeup that he throws to both lefties and righties. His fringey but hard upper-80s slider has short, vertical-axis movement. While a high-volume strike-thrower, Eppler doesn’t sequence in a way that maximizes his stuff, nor does he vary his in-zone location. He’s upper-level depth. Leandro Pina, RHP — A well-built, 19-year-old, Dominican righty with a thick lower half, Pina’s fastball lives in the 87-92 range, and he’s less physically projectable than his on-paper measureables make it seem. His command is also not as it appears on paper and still well below average. Pina’s delivery is quite deliberate, though he is athletic. He has feel for an already average changeup that could be plus at peak. Dario Agrazal, RHP, 0.9 KATOH — A pectoral injury ended Agrazal’s season after just one appearance at Double-A, but Pittsburgh was smitten with his strike-throwing ability enough to add him to the 40-man at the end of the year. He has a low-90s fastball and below-average secondary stuff, projecting as upper-level rotation depth. Jared Oliva, OF — Oliva went undrafted as a redshirt sophomore, as scouts considered him to be too raw and inconsistent. Oliva was on a loaded high-school team that included Rays 2016 seventh-rounder J.D. Busfield, but he featured a poor relationship with his coach, resulting in reduced playing time. He broke out in the spring of 2017, still suffering the occasional instinctive lapse while hitting a healthy .351/.411/.557. Oliva runs well enough to have a chance to stay in center field and has above-average raw power, although scouts are mixed about how much he’s going to hit. Rodolfo Castro, INF, 2.2 KATOH — Scouts think Castro, an 18-year old, switch-hitting, Dominican infielder, is an interesting low-level sleeper. He hit .277/.344/.479 in the GCL this year. Castro has above-average bat speed and a projectable frame, but his pitch recognition is currently poor. Scouts also want to see him load his hands a little shallower and smooth out his left-handed swing a bit. He saw time at second, third, and shortstop, with most scouts projecting him to third. That’s going to put more pressure on the bat, but there’s a chance Castro grows into the kind of in-game offensive output to profile there. Edison Lantigua, OF, 0.1 KATOH — The physically mature Lantigua had a strong 2017 in the Appy League, slashing .307/.411/.477 with 20 extra-base hits in just 48 games. He has above-average raw power but doesn’t have room for much more. He’s a patient hitter, but the high-effort nature of Lantigua’s swing creates some violence about the head, rendering him strikeout prone. He’s a 40 runner and likely left fielder, so those swing-and-miss issues need to be solved if Lantigua’s going to profile. Chris Bostick, UTIL, 1.1 KATOH — Signed as a minor-league free agent last offseason, Bostick had a strong year at Triple-A, slashing .294/.362/.418. He made his major-league debut in May and was up for all of September. He has good feel for contact and saw time at five positions in 2017, including increased time in center field. He’s not a great fit in center and lacks the pop to contribute elsewhere, with scouts considering him upper-level depth. Blake Weiman, LHP — An athletic, strike-throwing lefty from Kansas, Weiman walked just nine hitters in 78 innings split between Kansas and pro ball in 2017. He has a prototypical pitcher’s build at 6-foot-4, 185, and his delivery is fluid, but he may be short on stuff, as his fastball and slider are both fringey. Deon Stafford, C — Stafford had a monster sophomore year at St. Joe’s, hitting .395/.486/.702 with 18 home runs. His numbers were down as a junior, he struggled to throw, and his stock fell. Pittsburgh took him in the fifth round. Stafford is a below-average receiver with a below-average arm, and scouts hope both can grade out as average as they’re polished with reps. He has above-average raw power but was flummoxed by pro pitching in the summer and was strikeout-prone. There’s an interesting toolset here if Stafford can find a way to stay behind the plate. Mason Martin, 1B — A 17th-round pick out of Southridge High School in Washington, Martin lit up the GCL after signing, launching 11 homers and walking in nearly 20% of his plate apperances. Northwest area scouts bought into his power pre-draft but consider him a well below-average athlete with a maxed-out, 6-foot frame. What Martin did in his pro debut is exactly what he’ll have to continue doing to profile at first (and he’s not a good defender there), but most in baseball are skeptical of him doing so. Ronny Agustin, LHP — Agustin was in the 2017 Low-A bullpen as a 22-year-old, where he struck out 52 in 35.1 innings. He has an above-average fastball and will flash an above-average breaking ball. He’s a below-average athlete with a maxed-out frame and well below-average control. If the strike-throwing comes along, he could be a lefty relief piece. Alex Manasa, RHP — Manasa played both ways as a freshman at Jackson and was seen as more of an outfield prospect than a pitcher in high school. He threw only 21 innings for Jackson this spring but is a polished strike-thrower and fluid athlete on the mound. His fastball sits in the upper 80s, but his frame has room to fill out and you can dream on all sorts of pitch projection because of on Manasa’s athleticism, his cold-weather background, and the fact that he’s been robbed of pitching reps while playing on both sides of the ball. He was an interesting 11th-round flier. Max Kranick, RHP — A raw but physically and technically projectable high-school righty from Pennsylvania, Kranick recorded just 24 innings in 2017 while dealing with shoulder soreness, focusing rather on strength, conditioning, and his delivery. He sits in the low 90s with some feel for a breaking ball, and his new delivery is more athletic and changeup-friendly. He’s in the pupa stage of player development. Dylan Busby, 3B — The club’s third-rounder out of Florida State, Busby has good defensive footwork at third base and above-average raw power but has trouble with contact. Angel German, RHP — Acquired from Los Angeles in the Tony Watson trade, German was a talented mess. Reports on his stuff vary wildly. At his best, though, he’ll touch 99 with the fastball and spin a plus slider. He has 20 present command, and the stiff, violent nature of German’s delivery makes scouts apprehensive about projecting viable big-league control, let alone the kind of command required for German to pitch in the back of a bullpen. That said, he does have the raw stuff for that. Brandon Waddell, LHP, 1.8 KATOH — Waddell began experiencing control issues as a junior at Virginia and has never reclaimed the promising strike-throwing ability he showed as a sophomore. He now soundly projects in the bullpen despite possessing a starter’s repertoire depth. He was 91-94 with an average curveball and changeup out of the Glendale bullpen in the Fall League, which isn’t very exciting when compared to other big-league bullpen arms. It’s possible Waddell becomes a lefty specialist who can provide multiple innings if the situation calls for it. Yoel Gonzalez, C — Gonzalez hasn’t done much with the bat yet, but he does have some feel for contact and enough defensive ability to project as an average defensive catcher with an average arm. He’s a potential backup. Mitchell Tolman, INF, 1.3 KATOH — Tolman has good feel to hit, but he’s a 40 defender at second base and barely has the in-game power to profile there, let alone anywhere further down the spectrum. He projects as a multi-positional bench bat, provided he’s able to expand his defensive horizons. Tristan Gray, INF — Gray extended his long track record of hitting with a strong showing in the New York-Penn League after the draft. He was a .286 career hitter at Rice and on the Cape. Gray played all over the diamond in college, and Pittsburgh hopes that consistent reps at second base will allow him to be a passable defender there, as it’s where his middling offensive profile fits best. Jake Brentz, LHP, 0.2 KATOH — Signed to an overslot $700,000 bonus as an 11th-round pick by Toronto in 2013, Brentz has been traded twice, once to Seattle as part of a package for Mark Lowe and then to Pittsburgh for Arquimedes Caminero. He’ll touch 100 but has 20 control. Reyes was designated as Cistulli’s Guy in last year’s edition of this same exercise. Promoted to Double-A at the beginning of 2017, he basically duplicated his offensive numbers from the previous season. The walks, the strikeouts, the outcomes on contact: they were all almost identical to what he’d produced the previous season at a lower level. He complemented that batting line with another useful season in the field, making fewer appearances at shortstop but adding center field to his resume. The numbers are positive here, as well: according to the methodology employed both by Baseball Prospectus and Clay Davenport, Reyes produced above-average fielding-run marks while also occupying the more challenging end of the defensive spectrum. Everything about Reyes is modest: the tools, the physicality, even the outcomes. It’s also sufficient, however. For a player originally signed with a $45,000 bonus, sufficient is a major accomplishment. While the club’s inability to fully capitalize on Andrew McCutchen’s prime with a deep postseason run is surely the result of many variables, one can’t help but attribute it, in part, to the failure of some of the organization’s top prospects to contribute just as they were expected to make a final developmental leap. Josh Bell and Jameson Taillon ultimately carved out big-league roles, but neither Tyler Glasnow nor Austin Meadows have managed to translate their physical talents into major-league success. Such is the non-linear and cruelly random nature of prospect development. Perhaps, if the latter two had somehow realized their potential more expeditiously, we wouldn’t now be tasked with wondering what the Pirates might fetch in a trade of Gerrit Cole. And while Pittsburgh’s commendable, three-year run of contention is now over — if, perhaps, a shrewd couple of moves away from rebirth — the farm system looks healthy in the same way it did when the organization finally began producing talent again. It features several high-upside arms with big stuff that needs harnessing; many athletic, good-framed pitchers with lesser stuff for the player-development staff to mold; and lots of intriguing Latin American talent that was relatively unheralded on signing day. This system is deeper than it is exciting up top, with most of the five potential top-100 candidates looking more like average everyday players than stars. But, while volatile, prospects like Apostel, Cruz, Hearn, and all of the 2017 draft class have unique, exciting qualities. The Pirates international operations are now in flux as already infamous former international scouting director Rene Gayo — whose charisma and eye for talent were key in a market that demands both — was let go for financial impropriety. We hoped you liked reading Top 25 Prospects: Pittsburgh Pirates by Eric Longenhagen! Some of the arms look interesting, but the lack of hitting performance is a big concern. There is hope for Tucker yet, but the total lack of power from Hayes and Newman is not encouraging. I guess there is the recent example of Adam Frazier, but without a little more power I don’t see them as anything more than utility players. It seems like Tucker has enough power potential to keep pitchers honest. He’s 20, he looks pretty thin, and he’s already held his own at AA. 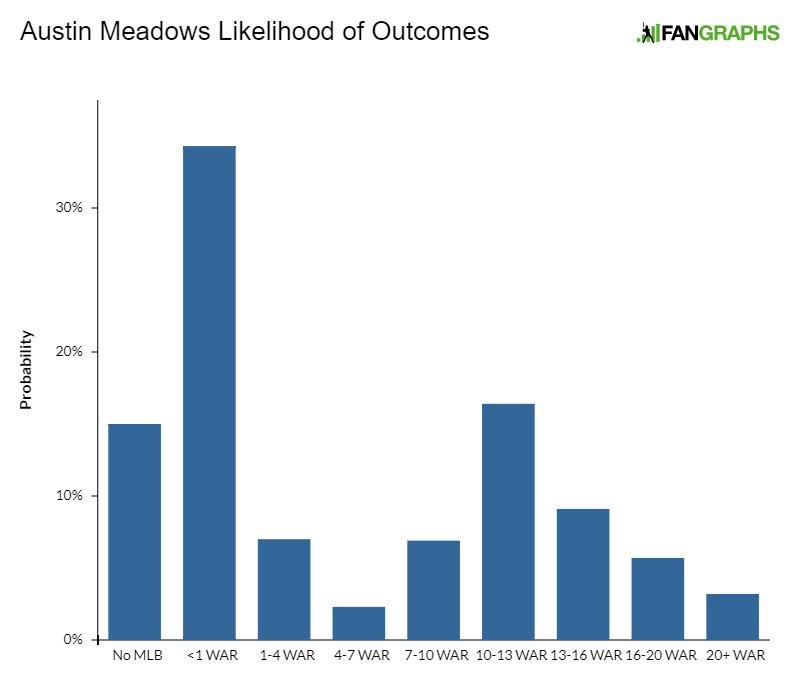 Depending on whether you think Meadows can fix himself, he might be the best prospect behind Keller. But Newman…I don’t buy him either. He’s not a great defender, and so the bat is really important. I am curious to see whether Hayes can survive with a Nick Punto-type profile. He’s a good enough defender that he might have a decent career even if teams are always looking to replace him. I’m getting less and less confident in Meadows’ ability to remain healthy. Hamstring injuries can be chronic (or maybe it’s just that they don’t heal properly sometimes)…and it sure looks like that’s what’s going on with him. I think I’m with you on this too.